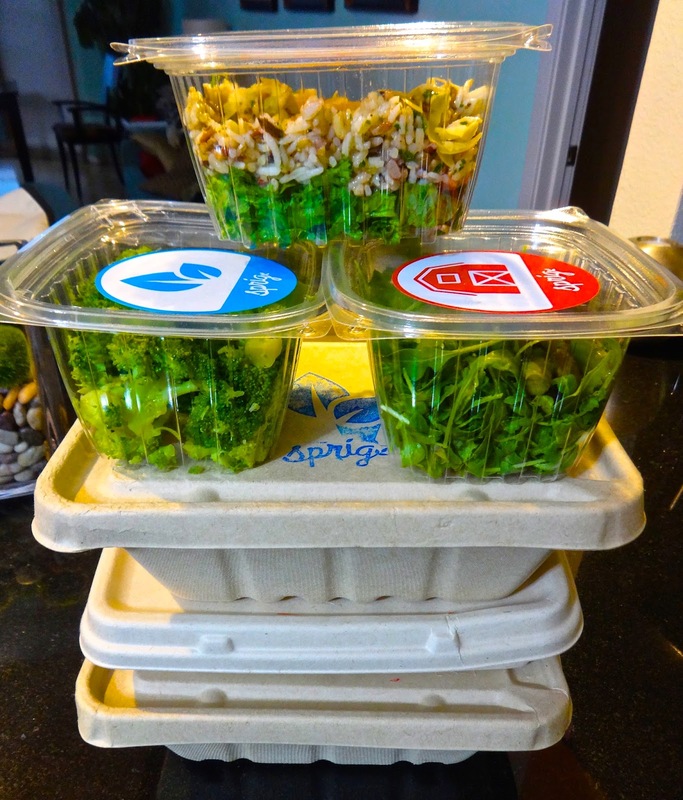 Sprig: A new, "artisanally crafted", sometimes chef curated, meal delivery service/start-up, offering hot, fresh delivery in 20 minutes (or so) that has taken off in San Francisco since it was launched. Matthew Accarrino: recently nominated James Beard Award chef de cuisine at SPQR. Him and the restaurant have gotten acclaim from the get go a number of years ago. He's been best chef something or other over the last few years and even has his own book (then again, don't they all). Convergence: moving toward one point and coming together to meet and form one interest, purpose or goal. Such was the case for Sprig and Accarrino who came together and coordinated on some chef curated meals by him, coincidentally, just a day after he was named a finalist for a James Beard Award--Best Chef: West. I'd not been to SPQR since he started his run there and I had been wanting to try Sprig since I'd heard about it. When I saw the Accarrino pairing, it seemed like the perfect time to order from them, see if they measure up to what they are offering and to try the chefs food. Granted, he didn't actually cook each dish, I'd need to hit up SPQR for that, but he did create the recipes, chose the ingredients and, I'm assuming, showed the Sprig chefs how to prepare the dishes to his specifications, thus I'm just going with "it's just like he did it himself." The Chef from SPQR book author photo. The premise with Sprig is you can order restaurant quality food, pre-made at a reasonable price and have it delivered to your door within 20 minutes of ordering. Entrees seem to run between $10-$15 and they change daily, thus you could have something different every night. .There is a delivery service fee (and tax) depending on your area of the city--mine was about $3, which I was okay with. Plus, you don't have to tip your delivery person, I'm guessing it's already built into the pricing structure they have plus the wages they pay. As with most things these days, it all works from an app I downloaded to my phone. It's very easy to use and when you login it brings up that days offerings. Dinner delivery begins at 4pm. I wasn't going to be home till 7:30 so I tried to time it to that. Sometimes they run out of dishes but will ping you with a push notification when they have more ready to go. It's an interesting feature that helped me work out my timing. I placed my order at 7:05 and immediately got text it would deliver in 20-25 minutes. Sure enough, they got to my place in 25 minutes from time of order and beat me home by 5 minutes. The driver called me and I was able to have him leave it at the front desk, this is where not having to tip came in handy since I wasn't there yet. But props for them, it was there in their stated time frame and still mostly warm to the touch. And just so me and the SO could get a good cross section (glutton) of the offerings I ordered all 3 entrees available. 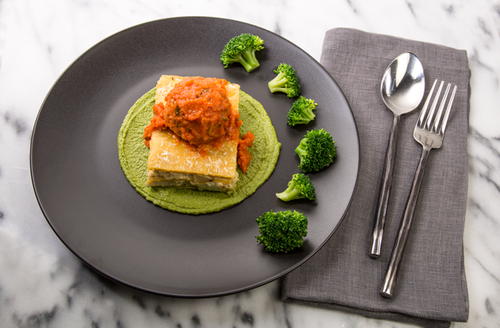 A vegetarian meal of roasted potato and ricotta lasagna with tomato braised quinoa breadcrumb meatballs, broccoli pesto and side of steamed broccoli. First thing to note is that we did not get the broccoli pesto like you see under the lasagna from the web photo. This probably is why the lasagna tasted dry to both of us. The pasta was overly crisp and tough to boot. The faux meatballs though were very tasty. Yes, they were thick, but they had the feel of meat and the tomato sauce had a lovely spicy kick too it. It was sad there wasn't the pesto or maybe more of the red sauce as they may have been able to help the lasagna overcome it's problems. As is, it tasted like a starchy carb bomb. The broccoli was nicely done, a little lemon juice, touch of garlic. A simple decent side. 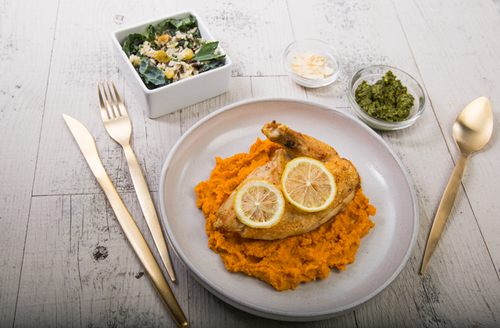 Meyer lemon roasted chicken with carrot chickpea mash, salsa verde and rice side salad with red frill mustard greens and almonds. First thing to note--again--we did not get the salsa verde. Might have been nice to get to see how it would have changed the flavor profile of this dish. As is, I did like this. Chicken was tender and juicy and the mash had a Middle Eastern flair to it. Presentation wasn't pretty, but the flavors were there. The rice and greens side salad was also a tasty addition, both warm and cold. It was all very comfort foodie and there was actually a lot of it here. I will say the portions were larger than I was expecting, that's a good thing. Plus, I kind of felt healthy eating it. This one was a definite step up from the first dish. Though, still thinking about that salsa verde. 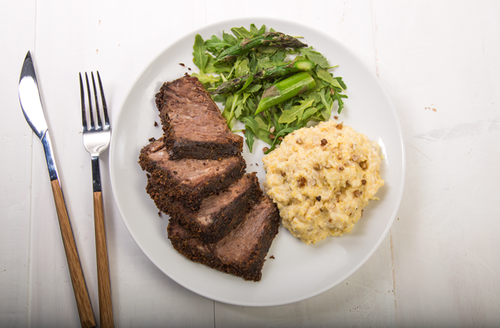 Fennel roasted beef, whole mushroom gravy, polenta with whole grain buckwheat and Oregon bleu cheese and arugula and asparagus salad with white balsamic dressing. Yeah, we got our sauce with this! Me and the SO both like the beef. It wasn't quite as medium rare as I like but it was still pull apart tender and full of flavor. It didn't really even need the mushroom gravy au jus sauce but it was nice to have as another flavor choice that was also good. The SO wasn't a fan of the polenta buckwheat mash but I was. It was hearty and yummy and went much better with the gravy to me. I wished there was more of it. The asparagus side was properly cooked and good. Not exciting mind you, but a nice green compliment to the brown and white main dish. Again, it was a larger portion of meat than expected, but I'm not complaining. Lack of sauces and a blah first dish aside, I was happily surprised by what I got. The other 2 dishes were pretty good and the larger than expected portions, which lead to lunch leftovers, were a real bonus to me. They met their delivery time, the food arrived still warm and the prices for these dishes, $10-$13, was relatively of value in relation to what we got. I couldn't see doing this everyday, well I could, if I had a six figure job or something, but as an alternative to the standard Chinese or pizza delivery options once in awhile, I was impressed with what I got. I will say though that when they asked me to rate the service I mentioned I didn't get a couple of the sauces and didn't hear back from them, so I'll chalk it up to a small lapse in customer service, but I won't (totally) hold it against them and I would order from them again. In fact, I find myself checking their app everyday to see what they are offering just in case the food and my tastebuds are on the same wavelength, then I'll hit that order button and sit back and wait for my fully cooked meal to arrive while laying on my couch watching stupid television. Which is basically a regular night at home.